On 26 May 1539, on the day of the Descent of the Holy Spirit (Pentecost), in Tver diocese, in Vyryshensk town situated amidst the virgin forest on the bank of the rivulet Vyryshna in the Okovetsk district, not far from the city of Rzhev, at a crossroads for people from four surrounding villages, the monk Stefan made a discovery: fastened to a pine-tree was a large iron cross and on another tree – a not-large oldly written icon, imaging the Mother of God with Child, and with Saint Nicholas of Myra the Wonderworker. With the discovery of the holy cross and the icon there shone an extraordinary light and healings occurred. Over the course of the weeks from Spirit Day to the onset of the Peter Lent, 27 healings occurred. The monk Stefan, and right after him the Rzhevsk priest Grigorii Onisiphorov, journeyed to Moscow with reports of the appearance of the holy icon and cross and the healing that occurred. The then head of the Russian Church, the Moscow metropolitan Joasaph (1539-1541), gave thanks to the Lord, and after verifying the miracles of that place, gave blessing to erect there two churches: the one in glory of the Bringing-forth of the Venerable Wood of the Cross of the Lord, and the other in honour of the Hodegetria Mother of God, having with it a chapel in honour of Sainted Nicholas the Wonderworker. At the consecration of the churches there was dispatched a priest and deacon from Moscow, together with church utensils, images, vestments, books and bells. 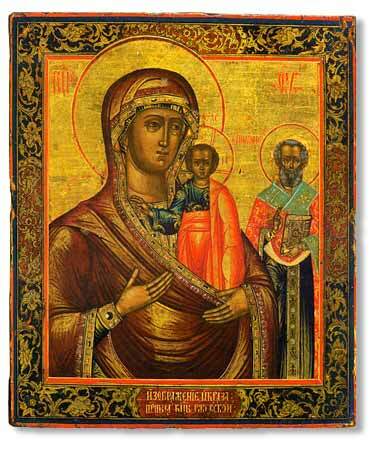 In January 1541 the Rzhevsk icon was solemnly transferred to Moscow for the consecration of a church in honour of the Rzhevsk Icon of the Mother of God. After the consecration of the temple, the icon and cross were transferred to the Uspensk (Dormition) cathedral, where they remained until 11 July. On this day the Rzhevsk icon and cross were returned to the place of their miraculous appearance. The metropolitan together with all the assembled clergy of the capital, and with the young tsar' Ioann (Ivan) Vasil'evich, and all the people, accompanied the icon from the Uspensk cathedral to the church of the Rzhevsk Icon of the Mother of God, where there was left a copy of this venerable icon. In memory of this celebration there was established the feastday of the Rzhevsk Icon of the Mother of God on 11 July.